For quantitative determination of total protein. • Fast and sensitive. Assay is completed within a few minutes. Linear detection range of 0.05 - 200 μg/mL BSA. The protein or peptide is known as the "building blocks of life" and is one of the most important macromolecules in life science. 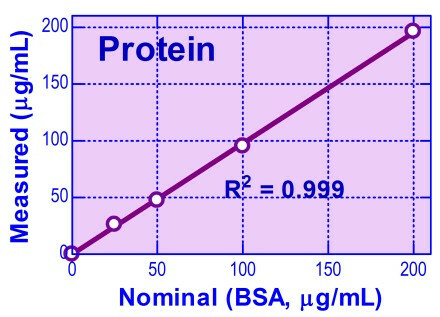 Protein determination is a very common practice. Simple, direct and automation-ready procedures for measuring protein or peptide concentration are very desirable. BioAssay Systems’ QuantiFluo™ protein assay kit is based on an improved o-phthalaldehyde method. This reagent reacts with primary amines in protein or peptide and forms a blue fluorescent product, allowing detection of nanograms of proteins. The fluorescence intensity (λex/em = 360/450nm) is proportional to the protein concentration in the sample. 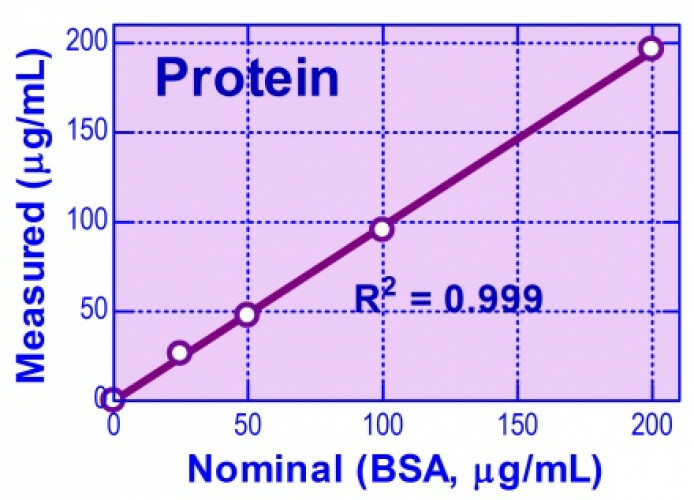 Applications For quantitative determination of total protein.